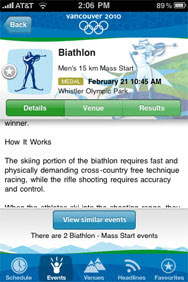 For those who are already visiting Vancouver or just going to visit it for the Olympic games the app 2010Guide will be a very useful tool in order to get oriented among howling crowds of fans and various tournaments. Moreover this is the official 2010 Olympics app representing "a location-aware schedule" for more than 2,000 sport and cultural events between 12-28 February, 2010. With this app you can easily find out what's going on currently near your location from the daily schedule of sporting up to cultural events including all the on-going details and access to Google Maps for further directions. Besides the app gives useful information about a particular sport game giving all necessary explanations and describing rules for playing it. So you will be more interested watching tours. So, before making the journey to Vancouver, don't forget to include this app into your iphone the more so it's Free!! !